This Father's Day I am very lucky - not only is Jaspret celebrating his second year of double fatherhood, but my parents have been staying with us this week, and so I'll be able to toast my own dad in person rather than over the phone! Naina and Niku have been excited all week at the prospect of taking Nana to their school's Father's Day Breakfast, and Naina even asked her teachers if she could make a special drawing for him: her rendition of her beloved grandfather's face with a caption that reads "I love my Nana because... sometimes he gives me water." Off to Father's Day Breakfast! This is particularly hilarious because in fact, Naina's Nana does EVERYTHING for her and her brother (above and beyond keeping them hydrated). When we wanted to take Naina to the zoo for the first time, it was Nana who volunteered to stay with Niku so Naina could enjoy herself without the distraction of an adorable, but rather moody brother in full throes of the "terrible twos." When Naina and Niku started school a few months ago, it was their Nana who came down to stay for two weeks to ease the transition, who took them to school on their first day, and who sat with Naina while she completed her first homework assignment. And when Niku was very young and couldn't fall asleep, it was Nana who walked him around for hours in his arms until his eyes finally closed. And I wouldn't expect anything less from him! 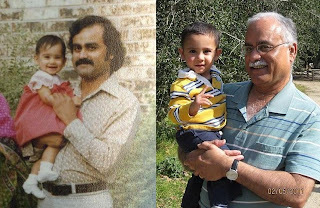 My dad did all the same things for me and my brother, Sameer. My memories of childhood are replete with little moments that have added up to the constant undercurrent of unconditional love, support, and groundedness that my father has provided for both of us. I don't think I could have survived these first years of new parenting, with all its emotional ebbs and flows, fatigue, and sacrifices, if I didn't have my father's example to inspire me, his advice to guide me, and his infallible confidence in the values and ethics he and my mother have instilled in us to anchor me. As a culture, we seem to always be debating, discussing, dissecting, and representing motherhood. The recent brouhaha over Amy Chua's memoir, Tiger Mother, is a good case in point. The internet and airwaves were ablaze with analysis of the types of mothering we have collectively seen, experienced, benefited (and in some cases had to therapeutically recover) from. While the crux of the debate was the (false) dichotomy between Eastern and Western styles of mothering, there was at least some room for more nuanced analysis of the multitudinous forms mothering can come in. What is also interesting to note is that throughout mothering served as the metonym for all types of parenting, and that in fact, a critical discussion of fathering never really ensued. Chua's husband, when mentioned at all, came to stand in for a lax, emotive, "Western" style of parenting, and Asian/ Asian-American fathers fell out of the picture completely. But in a way, that's not really surprising at all. Certainly, representations of Asian mothers are still plagued by caricatures (hello, "Tiger Mother"??) and an Orientalist paradigm of tradition versus modernity, but as I mentioned, we're beginning to see more richly textured portrayals of mothers and mothering, particularly in the diaspora. I don't know if the same can be said for representations of Asian fathers. Speaking specifically about representations of Indian fathers in Bollywood, Hollywood, and diasporic films and literature, besides a few notable exceptions (a big shout out here to Geeta Malik's film, Troublemaker, and Jhumpa Lahiri's novel, The Namesake, which in very different ways provide us with touching, complex, and very real portraits of South Asian men) I would argue that we're still locked into a polarized vision of Indian fatherhood. On one hand, you have the glorified patriarch of Bollywood films (i.e. every Amitabh Bhachan film since his comeback), the imposing figure whose wisdom guides his ever extending family through the dangers and hurdles of a rapidly changing world. On the other, of course, is the "Desi dad villian," the traditional father whose inability to deal with the shifting economic and social realities of migration and liberalization leave him emotionally bereft and often violently protective of whatever shreds of patriarchal power he still imagines himself to hold. Yes, without a doubt, stories do need to be told about the kinds of violence that exist in our community. But stories also need to be told about all the various avatars fathers come in as well, about all the other creative ways men deal with the exigencies of migration and modernity. I always felt that my own dad was missing from the repertoire of representations I would see and read. He grew up in Halol, a small town in Gujarat, the eldest of six siblings. As the eldest, he helped his mother with nearly all the household tasks - bringing fruits and vegetables, getting them ready for dinner, taking care of his brothers and sisters. His village did not have electricity until he was in high school, but this was no reason not to excel, coming first to Baroda for higher education, and then Bombay, Utah (BYU), and eventually Toronto, where he and my mother settled after their marriage. Growing up, my father was always engaged in our lives. He was ready to play the minute he came back from work, and always sat down with us when it was time to do our homework. Wiffle ball, Mille Bornes, Monopoly, algebra, trigonometry, the science fair project where I experimented with exhaust fumes and plant growth (?? ), you name it, Dad could do it. But it was not just games and homework, my father was the one who helped me pick out fabric to make my first quilt, who comforted me when my homemade prom dress turned out a hot mess and then convinced me to give it another try (the same could be said for boys I suppose), who gave me my first feminist lesson in the unjust and purportless nature of cheerleading (I ended up joining the basketball team instead). He came to every award ceremony, cheered me through every decision I made in college, and encouraged me when I chose to go to graduate school to obtain my degree in English literature (while other men of his age and background questioned why I needed to get a Ph.D. in English when I already spoke English or condescendingly referred to my profession as a "little job"). He moved me to Michigan and then, without one word of admonishment, moved me back to Irvine when I realized I was perhaps a California girl after all. And still, to this day, he is the one I turn to read my work, to remind my why I got into this field, and to give me hope and, more importantly, perspective, when I feel like my future isn't what I once thought it would be. So, this Father's Day, I celebrate my husband and my father, two men whose incredible devotion to their families and children defy stereotypes and continue to make me strive to be a better woman.